Jessup Manufacturing Company Glo Brite Eco EXIT Zero Energy Signs offer easy installation and no maintenance in an environmentally GREEN design for most exit signs applications with 100 foot visibility requirements. This PM100 Series sign has a photoluminescent background within a mountable plastic frame and DOUBLE sided viewing. This PM100 Series sign has a photoluminescent background within a mountable plastic frame. The frame can be ceiling, wall or flag mounted. The sign size with housing is 15 3/8 x 8 3/4 x 3/4 inches. The letters are 7 inches in height. The sign comes with a GREEN plastic frame. The signs are UL 924 for Emergency Lighting and Power Equipment. The Jessup Glo Bright ECO EXIT signs meet NFPA Life Safety Code101 and OSHA requirements. 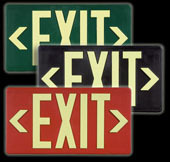 This Jessup Glo Brite Eco-Exit DOUBLE sided sign is part number 7082-B with GREEN housing. Click here to return to the full list of Jessup Glo Brite Eco Exit Signs.